The Cuisinart 744-24 chef's classic 6 qt. 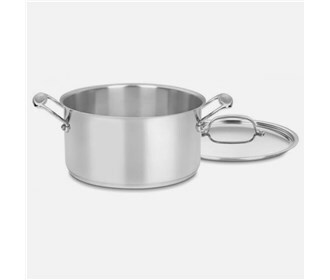 sauce pot is perfect for simmering soups or boiling pasta. It has 18/10 stainless-steel construction that won't react to acidic foods and includes an aluminum incapsulated base to ensure foods heat quickly and evenly. 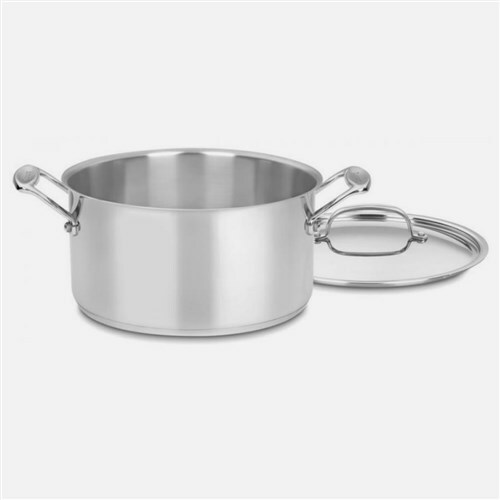 The cookware's riveted stainless-steel handle stays cool on the stovetop, while its lid seals in moisture and nutrients for healthier, more flavorful results. The Cuisinart 744-24 has many exciting features for users of all types. You can extend the lifetime of your Cuisinart 744-24 with the purchase of a FactoryOutletStore Factory Protection Plan. See the Cuisinart 744-24 gallery images above for more product views. The Cuisinart 744-24 is sold as a Brand New Unopened Item.